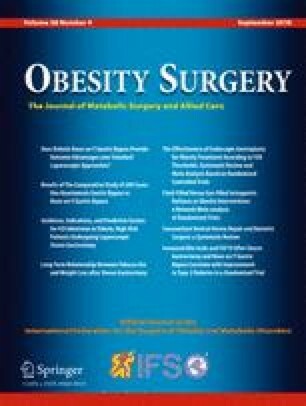 Sleeve gastrectomy (SG) and Roux-en-Y gastric bypass (RYGB) are both effective bariatric procedures to treat type 2 diabetes (T2DM) and obesity. 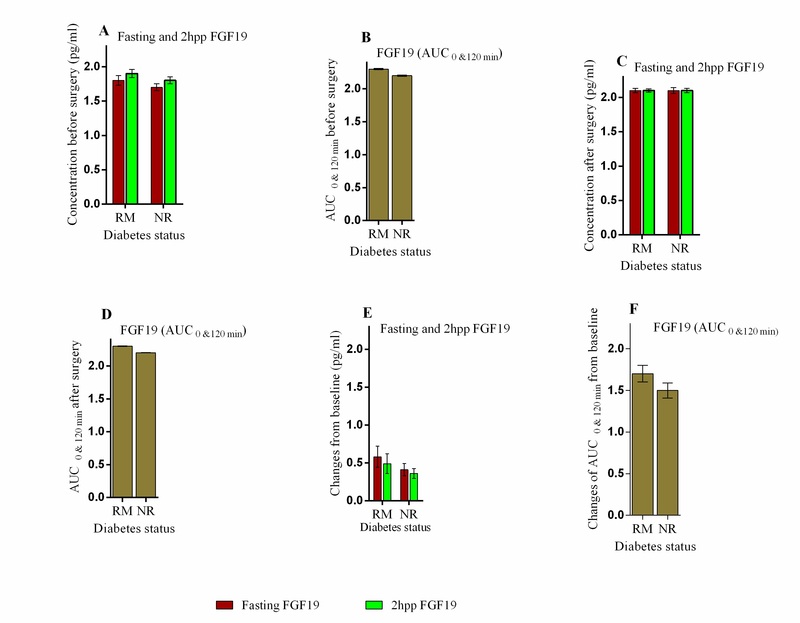 The contribution of changes in bile acids (BAs) and fibroblast growth factor19 (FGF19) to such metabolic improvements is unclear. We examined associations between changes in BAs, FGF19 (fasting and prandial), with changes in body weight, glycemia, and other metabolic variables in 61 obese patients with T2DM before and 1 year after randomization to SG or RYGB. Weight loss and diabetes remission (defined by HbA1c < 39 mmol/mol [< 5.7%] in the absence of glucose-lowering therapy) after RYGB and SG was similar (mean weight loss − 29 vs − 31 kg, p = 0.50; diabetes remission proportion 37.5 vs 34%, p = 1.0). Greater increments in fasting and prandial levels of total, secondary, and unconjugated BAs were seen after RYGB than SG. Fasting and prandial increases in total (r = − 0.3, p = 0.01; r = − 0.2, p = 0.04), secondary (r = − 0.3, p = 0.01; r = − 0.4, p = 0.01) and unconjugated BA (r = − 0.3, p = 0.01; r = 0.4, p < 0.01) correlated with decreases in HbA1c, but not weight. Changes in 12α-OH/non 12α-OH were positively associated with prandial glucose increments (r = 0.2, p = 0.03), HbA1c (r = 0.3, p = 0.01), and negatively associated with changes in insulinogenc index (r = − 0.3, p = 0.01). Only changes in prandial FGF19 were negatively associated with HbA1c (r = − 0.4, p < 0.01) and visceral fat (r = − 0.3, p = 0.04). The association between increases in secondary, unconjugated BAs and improvements in HBA1c (but not weight) achieved after both RYGB and SG suggest manipulation of BA as a potential strategy for controlling T2DM through weight-independent means. The online version of this article ( https://doi.org/10.1007/s11695-018-3216-x) contains supplementary material, which is available to authorized users. We thank all the participants who took part in this study and the larger clinical research team who made this study possible. We would like to thank Dr. Ashveen Nand from Auckland University of Technology for the assistance in LC-MS/MS analysis and Dr. Ian Ong from North Shore Hospital, Waitemata District Health Board, for the assistance with ascertainment of cholecystectomy status from clinical records. R.M., J.L., and L.P. conceived the project and designed study. R.N., M.B., D.D., J.L., and L.P. performed sample and/or data collection. R.N., J.L., L.P., and R.M. analyzed the data. R.N., R.M., L.P., and J.L. wrote the manuscript. All authors have read and agreed with the final version of this manuscript. The main clinical trial was funded by Waitemata District Health Board. Additional grant for biochemical analyses was obtained from the Maurice Wilkins Centre for Biodiscovery. The funders had no role in the analyses, interpretation of findings, manuscript review or decision to submit the manuscript for publication. All procedures performed in this study involving human participants were in accordance with the ethical standards of the New Zealand national research committee and with the 1964 Helsinki declaration and its later amendments or comparable ethical standards.